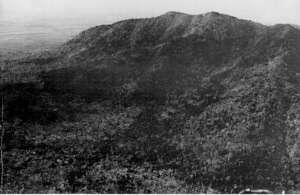 Some 9000 metres to the west of the Task Force area lies the mountain mass known as the Nui Dinh Hills. which rise to a height of about 2000 feet. From these heights the panorama of Phuoc Tuy Province is laid out like a multi-shaded carpet of green. The heights offered excellent observation of the area for the Viet Cong, some of these had been developed with concrete as permanently manned observation posts. All formed an observation network which included all road traffic along Route 15 and Inter-provincial Route 2, all activity connected with the Task Force Base, air movement between Saigon and Vung Tau particularly, and shipping movements in the Vung Tau road steads. On clear days Saigon far to the north-west can be seen. During the period 8th September to 24th September, 1966, the Battalion climbed the northern face of the mountains and searched the features for any enemy. The ground was densely covered with bamboo, creepers and vines, which made the going extremely tough. The weather experienced was in the main good; though towards the last week of the operation heavy rains hampered movement. At first the Battalion concentrated to the north of the hills, in paddy and light scrub. 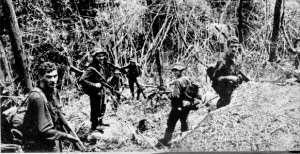 On the first day A Coy contacted 10-11 Viet Cong. who fled with no casualties, to either side. The other contacts of any note were made by A and C Companies. On the 10th of September, 1966, a party of four Viet Cong was intercepted by A Company resulting in one Viet Cong killed. Later that day C Company, having denied a spur line to the enemy, came under covering fire from a ridge while five Viet Cong attempted to reach the top of the spur. After a short but inconclusive fire fight the enemy retreated without casualty. A Company on the 14th of September had two contacts. The first was at 8 o'clock in the morning., three VC strolled down a track into 1 Platoon's position while the platoon was searching an enemy camp. The platoon killed two and wounded one. Two hours later contact was made with 10 Viet Cong in the same area resulting in 4 Viet Cong being killed. On the 16th of September, D Company killed 1 Viet Cong on the outskirts of an enemy camp which was then destroyed. Two enemy observation posts were also destroyed during the operation. On the night of 1 Ith of September, B Company reported seeing lights, which were not engaged for reasons of the Battalion maintaining security. It is now thought that those lights came from the important camp found on 17th of September, which was the permanent headquarters of the Chau Duc District Commission. The camp was defended by 15 weapon pits surrounding 23 huts. There were also 19 tunnels and food hides. This camp had been hurriedly evacuated on the 14th of September, as cooked food and calendars left behind proved. The Chau Duc Commission is made up of two sections, one being political, with a political officer, executive officer, secretary and a staff. The other, the military affairs section, with a Chief of Military Affairs section, with a Chief of Military Affairs, an executive officer and staff. The guards and staff would number approximately 100. There was also a communications and liaison platoon of 26 men. The destruction of this camp by B Coy, the capture of many documents from it, must have surely hurt the enemy. The camp had been built over the years, and was permanently occupied. The Viet Cong could not afford to lose installations of this type. It was apparent that the hills had been a Viet Cong sanctuary and that our intrusion was the first entry into the area by the Allies for some considerable time. This operation must have disrupted the Viet Cong, and made them wary of any large-scale use of the hills in the future. It was evident that at least one, maybe two local force companies were based in the hills. It is assumed that the main body of troops were away from the area, on tasks connected with the harassment of the elections for the Constituent Assembly, which was to take place on the Ilth of September, 1966. 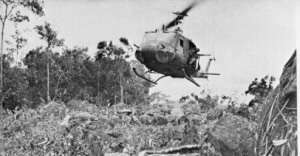 The helicopter resupply, troop movement, and back loading were made under very difficult conditions; the landing zones were the worst experienced by the Battalion. 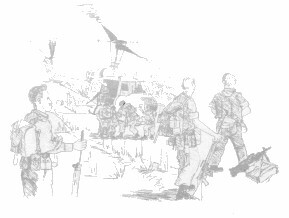 Often an outcrop of rock from which the timber had been cleared, or the top of an escarpment, were turned into hazardous Landing Zones by the Pioneer Platoon. Tribute is paid to the crews that used them, without complaint. 4 wounded in action 15 civilians detained. Own - 1 wounded in action. Hand tools (saws, hammers, axes) - Clothing -Various mines and grenades. The Battalion destroyed a number of installations and camps.